A new exhibition of 15 of Don Van Vliet’s paintings opens today and runs until 6 July at the Anton Kern Gallery in New York. There is a catalogue of the exhibition and it includes a preface by Polly Harvey. More information, a press release and nine paintings from the exhibition can be viewed at the Anton Kern Gallery website along with a press release. How I would love to attend – if you make it to the exhibition please do let us all know by posting a report to this blog. According to the press release, there should be another show at the Michael Werner gallery, though I haven’t found any details about that. I am hoping to make it to the show. Yes, the Werner Gallery is also having a showing. May 31st to June 29th. I’ll be sending photos next week to the hippest site on the web. What I wouldn’t give to find out how Don Van Vilet is today. Does anyone know if he’s still painting? 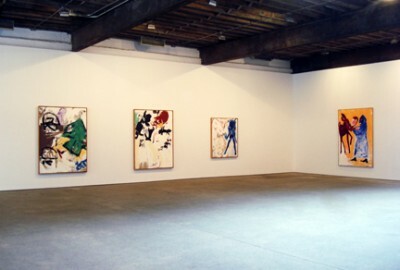 There are eleven paintings in the show and a group of ten drawings. The latest painting is from 1991, the drawings are from 1999. Indeed, his health does not allow him to paint any longer. He also does not travel much at all and he will not be here tonight. I hope you can make it though. I attended the opening of the exhibit last Thursday. Took a red-eye from Oregon, got in Thursday am and made the 6pm showing. There were a handful of Beefheart freaks, some curiosity seekers and art patrons doing the gallery rounds. The paintings are fantastic. Photos hardly do them justice because many of them are heavy with paint. Very heavy with paint, in some instances. Also, he painted a great deal on unprimed canvas and he leaves large areas of the canvas exposed. It’s a wonderful effect. The smaller paintings started at $35,000 US. The larger ones went up to $110,000 US. Maybe 120,000. The drawings, which I did not see, but have seen before at the Werner Gallery, are $4,000 each. I was a the Werner Gallery this past January looking over the Van Vliets (paintings and drawings). They said he hasn’t done anything, artwise, since 1999 or 2000. The drawings were the last pieces of art he’s done and they are essentially scribbles. There’s not much to them. But the paintings. Oh Lord. The paintings are a site to behold. If you can get to NYC this month, go and see ’em. There’s nothing like standing if front a great piece of artwork a few feet away, be it Van Vliet or Van Gogh. their feet, to hang on every word. Thank you Don. Thank you for sharing yourself with us. The show just ended. They had a really wonderful catalog with nice reproductions for $20. There may still be some left, perhaps the Anton Kern Gallery would sell them. Their phone is 212-367-9663. You have to be a musian of some sort to really appreciate the genious of Captain Beefheart. Hence the friendship with P. J. Harvey.